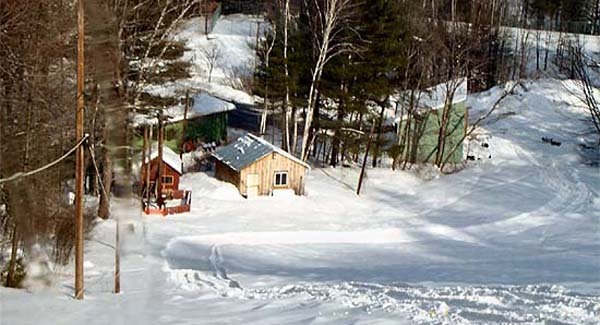 Located on the southwestern side of the village of Bellows Falls in Rockingham, the Bellows Falls Ski Tow has been in and out of operation for over half a century. The roots of the Bellows Falls ski tow come from a nearby area named the Ski Bowl, which operated from the late 1930s until around 1950. At this time, the rope tow was reportedly relocated to the present day Bellows falls Ski Tow area on the southeastern side of Oak Hill. According to NELSAP, the area closed down briefly in 1992 and again in 1998. The area likely reopened for the winter of 1999-00. A new warming hut was constructed for the following season. The Rockingham Recreation Department continues to operate the rope tow when natural snow conditions allow.